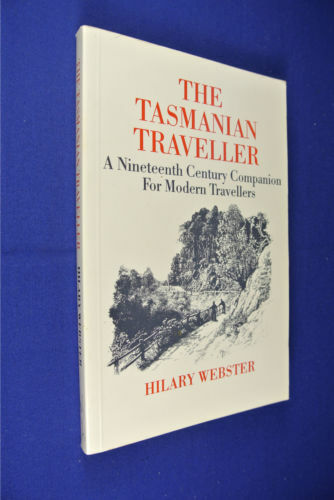 In the late 1980s, Hilary Webster compiled a book of short stories written by people who travelled around Tasmania by foot and by horse and carriage in the nineteenth century; The Tasmanian Traveller A Nineteenth Century Companion For Modern Travellers. Thanks to blog follower Ma, I was alerted to this publication. These stories helped me to understand the difficulty of travel in early colonial Tasmania when roads were not always developed. Some stories surprised me so that I feel inspired to visit Tasmania’s State Archives in order to discover more. A standout was the story of a walk from ‘Trial Harbour to the Ouse” because the journey relates to some of the area over which I may walk later this year when I restart my walk along the Derwent River. Trial Harbour is an isolated tiny community on the west coast north of Queenstown where, these days, the few shacks are built with the strangest chimneys to cope with the weight of the westerly winds which blow fiercely from across the Indian Ocean. The Ouse refers to a small town, then hamlet, somewhat south of the centre of Tasmania and situated most remotely from civilisation. Back then, it took a day’s coach and train ride to reach Hobart. These areas and the land between is an exceptionally rugged environment today and I have difficulty imagining the situation in the 19th century when the walk in the story was taken. The subtitle of the 1890s story was ’A Lady’s Walking Tour on the West Coast’. A woman (no name) walked with her husband and a dog through ‘untamed’ wilderness, along mining and forestry tracks and the occasional muddy rutted roads. They climbed mountains, crossed button grass plains and walked through valleys. She recorded “More than once we were asked our business, the notion of travelling on foot for pleasure in these regions appeared preposterous.” I would say such a walk is extraordinary in this day and age, and totally amazing 125 years ago. Innovative means were taken to cross rivers. Overnight accommodation was found in out of the way tiny remote mining shops, shacks, huts and the occasional Inn. Telegraph wires were often their only guide for a way forward. Through the rugged wilderness, routinely they walked 17 or more miles (27+kilometres) each day and on one day they walked 33 miles (53 kilometres). I am staggered. I know the challenging environment in which they walked. The mountains are many and very steep with ravine and river gullies that are cut into the rock deeply. Her pack of provisions weighed 7 pounds while her husband carried 21 pounds. This makes me wonder if contemporary bushwalkers aren’t tough enough – or are we trying to be prepared for every eventuality. The good will of people they met and the willingness of others to share their meagre food supplies, and help with sleeping arrangements, was perhaps something that could be taken for granted in 19th century Tasmania. Generous hospitality as a given. ‘We got some bread here, and at a house a mile further on the track, some milk, the first fresh milk we had tasted since Waratah.’ This comment indicates she was walking across Tasmania before Trial Harbour – the significant mining town of Waratah is quite a distance north east of Trial Harbour. So I suspect there may be earlier stories of her walking across other parts of Tasmania – I look forward to conducting research to find records of these. This entry was posted in Derwent River, Tasmania, Walking and tagged 1890s, A Lady’s Walking Tour on the West Coast, chimneys, coach, colonial Tasmania, Derwent River, environment, Hilary Webster, horse and carriage, nineteenth century, Ouse, Queenstown, shacks, short stories, Tasmania, The Tasmanian Traveller A Nineteenth Century Companion For Modern Travellers, train, travel, Trial Harbour, Trial Harbour to the Ouse, Waratah on June 20, 2015 by Tasmanian traveller. As an exchange student, I stopped in Ouse. One of my fellow exchangees had to post a letter from there because there was an Ouse in her home country. But for that, I may have missed it! I should have guessed. You have never let the grass grow under your feet – you certainly have got around Tassie. I am looking forward to getting to Ouse later this year when the weather warms up. For now at least the rain has stopped. I am in awe of the walkers around the world (particularly in England) who happily walk in the rain and mud. Not my idea of fun!